Epidural steroid injections (ESIs) have been endorsed by the North American Spine Society and the Agency for Healthcare Research and Quality (formerly, the Agency for Health Care Policy and Research) of the Department of Health and Human Services as an integral part of nonsurgical management of radicular pain from lumbar spine disorders. The first documented epidural medication injection, which was performed using the caudal approach (see the image below; see also Approaches for Epidural Injections) was performed in 1901, when cocaine was injected to treat lumbago and sciatica (presumably pain referred from lumbar nerve roots). According to reports, epidurals from the 1920s-1940s involved using high volumes of normal saline and local anesthetics. Injection of corticosteroids into the epidural space for the management of lumbar radicular pain was first recorded in 1952. Also, see the Pain Management: Concepts, Evaluation, and Therapeutic Options slideshow to help assess pain and establish efficeffective treatment plans. ESIs can provide diagnostic and therapeutic benefits. Diagnostically, ESIs may help to identify the epidural space as the potential pain generator, through pain relief after local anesthetic injection to the site of presumed anatomic pathology. In addition, if the patient receives several weeks or more of pain relief, then it may be reasonable to assume that an element of inflammation was involved in his or her pathophysiology. Since prolonged pain relief is presumed to result from a reduction in an inflammatory process, it is also reasonable to assume that during the period of this analgesia, the afflicted nerve roots were relatively protected from the deleterious effects of inflammation. Chronic inflammation can result in edema, wallerian degeneration, and fibrotic changes to the neural tissues. Radicular pain often is the result of nerve root inflammation with or without mechanical irritation. Clinical practice and research demonstrate that mechanical compression alone to the nerves causes only motor deficits and altered sensation but does not necessarily cause pain. Inflammation within the epidural space and nerve roots, as can be provoked by a herniated disk, is a significant factor in causing radicular pain. Historical evidence of nerve root inflammation has been demonstrated during surgery in patients with radicular low back pain (LBP) from lumbar disk herniation. Animal research in dogs and rats also has revealed severe inflammation locally within the epidural space and nerve root after injection of autologous nuclear material into the epidural space. A high level of phospholipase A2 (PLA2), an enzyme that helps to regulate the initial inflammatory cascade, has been demonstrated in herniated disk material from surgical samples in humans. Leukotriene B4, thromboxane B2, and inflammatory products also have been discovered within herniated human disks after surgery. Animal models have demonstrated that injection of PLA2 into the epidural space induces local demyelination of nerve roots, with resultant ectopic discharges (which is considered the primary pathophysiologic mechanism for sciatica [radicular pain]). The radicular LBP caused by spinal stenosis is probably related to the inhibition of normal nerve root vascular flow with resultant nerve root nutrition, nerve root edema, and nerve root dysfunction. Chronic nerve root compression can induce axon ischemia, impede venous return, promote plasma protein extravasation, and cause local inflammation. If dorsal root ganglia are chronically compressed and irritated, this theoretically can lead to their sensitization and resultant radicular pain. Similar mechanisms of radicular pain are postulated to occur in the thoracic and cervical spine as well. In summary, clinical practice and animal research suggest that radicular pain is the result of inflammation of the nerve root in the epidural space provoked by leakage of disk material, compression of the nerve root vasculature, and/or irritation of dorsal root ganglia from spinal stenosis. Although the primary indication for epidural steroid injection (ESI) is radicular pain associated with a herniated nucleus pulposus, a variety of other indications have been reported in the literature. In addition, fluoroscopy should not be used in epidural injections for women who are pregnant, to avoid exposing the fetus to ionizing radiation. Caution should be used when performing injections in patients with poorly controlled diabetes, since the corticosteroid may transiently, but significantly, increase blood glucose levels. Patients with a history of immunosuppression may require additional precautions, such as preprocedure laboratory testing and/or antibiotics. Caution should be exercised when performing injections in individuals who have a history of congestive heart failure because of the potential for steroid-induced fluid retention. Although numerous articles have supported the benefit of ESIs for LBP, especially if the pain is caused by radiculopathy, other studies have disputed the efficacy of these procedures. Unfortunately, most of the earlier studies (those that failed to show a benefit from the injection) had significant limitations. Aside from using a less-than-desirable research methodology, most of these studies did not use fluoroscopy and radiographic contrast to document accurate placement of the injected substance into the epidural space. Many also failed to demonstrate that injection was performed at a presumed level of pathology, which has been shown to be critical to the success of ESIs. 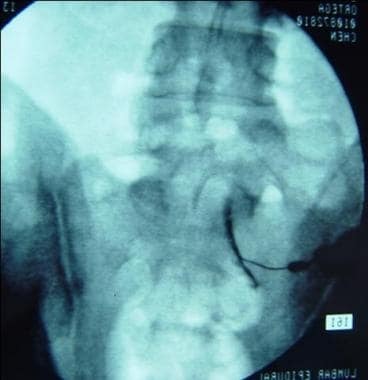 Studies have reported that without fluoroscopy and radiographic contrast confirmation, incorrect injection placement (ie, placement outside the epidural space) occurs in 30% of cases, on average, even when ESI is performed by experienced injectionists. These methodologic problems most likely were the major factors that led to the mixed assessment of ESIs. As with other medical procedures, the efficacy of the ESIs is related to many factors. Aside from the clinician's experience and training, other factors that play an important role include patient selection, symptom duration, underlying pathophysiology, ESI approach, the use of fluoroscopy and contrast enhancement, and the vocational status, as well as the socioeconomic and psychological circumstances, associated with the individual patient. In general, patients who have had symptoms for less than 3 months have response rates of 90%. When patients have had radiculopathy symptoms for less than 6 months, response decreases to approximately 70%. Response decreases to 50% in patients who have had symptoms for over 1 year. Patients with symptoms of shorter duration have more sustained relief than those with chronic pain. Patients with chronic back pain generally have better response if they develop an acute radiculopathy. Patients with factors favoring the use of ESIs also include those who have not had previous back surgery, who are not on workers’ compensation, who are aged younger than 60 years, and who are nonsmokers. In a cross-sectional study design at a university spine center, 76 patients with sciatica were followed for a mean of 122 days after receiving transforaminal ESIs. Of these patients, 47% experienced improvement, 28% were unchanged, and 16% worsened. The least favorable outcomes were associated with patients receiving Social Security Disability Insurance (SSDI) or workers’ compensation payments and with those whose work required heavy lifting. Patient response to ESIs is also related to underlying pathophysiology. In general, acute radicular pain from lumbar disk herniation responds more favorably than does radicular pain from lumbar spinal stenosis. Patients with radicular pain after lumbar spine surgery frequently receive less benefit from ESIs unless the radicular pain is from a recurrent herniated nucleus pulposus. Still, ESIs are often helpful for radicular pain from stenosis. In 2002, Vad and colleagues reported a prospective randomized study comparing transforaminal lumbar epidural injection with lumbar paraspinal trigger-point injection. They randomized 48 patients with sciatica from herniated disk pulposus (confirmed by lumbar spine MRI) into 2 groups. One group received transforaminal lumbar epidural injection, and the other received a lumbar paraspinal intramuscular injection with saline. The average follow-up period was 16 months. The authors used patient satisfaction, the Rolland-Morris scale, and pain reduction extent as indices for efficacy. The success rate in the transforaminal injection group was 84%, compared with 48% in the saline group. Botwin and colleagues demonstrated the efficacy of the transforaminal epidural injection in their retrospective cohort study in patients with sciatica (caused by lumbar spinal stenosis). Thirty-four patients who did not respond to nonsteroidal anti-inflammatory agents and oral analgesics received 1.9 injections (average). At 1 year, 75% of the patients had greater than 50% pain reduction, 64% improved their walking duration, and 57% increased their standing tolerance. An additional benefit of ESIs in many patients is that the injections can potentially obviate the need for hospitalization and surgery in many patients. Riew and colleagues reported results from a prospective, randomized, double-blinded, controlled clinical trial on 55 patients with severe sciatica from spinal stenosis or lumbar disk herniations. These patients had not responded to 6 weeks of conservative treatment and were considered to be surgical candidates. The patients were divided into 2 groups; 1 group received lumbar epidural injection with bupivacaine and steroid, while the other group received only bupivacaine. Up to 4 lumbar epidural injections were delivered if needed. The follow-up period was 2-3 years. The study demonstrated that only 23% of patients in the group that received lumbar ESIs needed surgery, while 67% of patients in the bupivacaine injection group underwent surgery. The difference was statistically significant. A follow-up study at 5 years found that 17 (81%) of 21 patients surveyed still had still not opted for surgery. This report demonstrated a benefit from lumbar ESIs in patients who had been diagnosed with lumbar spinal stenosis or herniated nucleus pulposus, with the injections helping to reduce the need for surgery. A recent systemic review of 14 randomized and 10 nonrandomized studies on the efficacy of lumbar transforaminal epidural steroid injections for lumbar radicular pain was performed by Manchikanti L et al. The results demonstrated that the efficacy is good for radiculitis secondary to disk herniation with local anesthetics and steroids and fair with local anesthetic only, efficacy is fair for radiculitis secondary to spinal stenosis with local anesthetic and steroids, and efficacy is limited for axial pain and postsurgery syndrome using local anesthetic with or without steroids. Barre and colleagues reported that in 35% of patients with symptomatic lumbar spinal stenosis who received caudal ESIs, a visual numeric score improvement of 50% or greater was seen. Long-term treatment success was seen in 35% of patients after a mean follow-up of 32 months. Anwar and coauthors demonstrated that caudal injections could benefit patients with limited straight leg raise and symptoms of radicular pain or spinal stenosis; in this study, 65% of patients were noted to have some improvement at 3 months. It is important to know that at least 3 cases of lumbar paraplegia have been reported, and each developed after interlaminar lumbar epidural steroid injections. The suspected mechanism is similar to a paraplegia caused by a lumbar transforaminal ESI in which the epidural needle penetrates the radicular medullary artery, and the particulate corticosteroid being injected into this artery inside the spinal canal results in an embolism of spinal cord and subsequent paraplegia. In fact, the anatomical studies have demonstrated that after the radicular medullary arteries enter the neuroforamen in the anterior aspect of exiting nerve root and dorsal root ganglion, they often travel a distance superiorly and laterally in the lateral epidural space to join the anterior spinal artery supplying the anterior two thirds of the spinal cord. Additionally, in about 63% of cases of cadaver studies, there is a posterior branch of the radicular medullary artery going to the dorsal aspect of the cauda equina. It is conceivable that the epidural needle in the interlaminar lumbar epidural steroid injection will very likely encounter the radicular medullar artery in the lateral aspect of the epidural space or midline posterior epidural space. As the paraplegia after interlaminar lumbar ESIs is often underreported, the exact frequency of this event cannot be determinted. It is clear that in light of the anatomical positions of these radicular medullary arteries inside the spinal canal as described above, neither midline nor parasagittal interlaminar lumbar ESIs are completely risk free with respect to vascular injury and paraplegia. The alternative approach using the Kambin triangle may be the better choice (see below for description). More evidence favors the use of transforaminal ESIs in the lumbar spine compared with the cervical spine. Although the interlaminar approach (see Approaches for Epidural Injections) may allow the injectate to flow to the site of pathology by migrating around the thecal sac and into the ventral epidural space, the transforaminal route is presumably more reliable for delivering the steroid to the affected area in cases of disk herniation in which the disk comes into contact with the nerve root. Rhee and colleagues found a difference in patients undergoing interlaminar and transforaminal ESI. Those patients who underwent transforaminal injections had a 46% reduction in their pain score, and 10% went on to need surgery. In contrast, patients who had interlaminar injections had a 19% reduction in pain, and 25% required surgery. The above discrepancy of efficacy may be due to the lower response to epidural steroid injections in general because of the chronicity of the radiculopathy; alternatively, it may reflect the differences of timing in follow up between the 2 studies. It is generally agreed that ESIs offer short-term (several months) pain relief. Buttermann and colleagues conducted a study involving individuals with a lumbar disk herniation of greater than 25% of the cross-sectional area of the spinal canal; the patients were administered ESIs one level above the herniation. The patients received up to 3 injections, with 42-56% of these individuals reporting the treatment to be effective. There was a cross-over of patients who first underwent ESIs and then diskectomy. For those who underwent an initial trial of ESIs, the delay in surgical decompression was not found to be detrimental to neurologic recovery at time of follow-up. A systematic review of cervical interlaminar epidural injections concluded that such injections are effective for relief of cervical radicular pain in the upper limbs; the report strongly recommended the procedure. However, there were no randomized trials identified in this review. Reports suggest that injection without fluoroscopic guidance (ie, blind injection) results in 30-40% of needle misplacements, such as needle tip placement outside the epidural space (including intravascular injection) and placement not at the presumed level of pathologic process. Therefore, it is recommended that ESIs be performed under fluoroscopic guidance and with radiographic contrast documenting appropriate placement in order to improve the safety, accuracy, and potential efficacy of ESIs. Fluoroscopy in conjunction with contrast is used to improve efficacy and minimize potential complications. Furman and coauthors discovered that for lumbar spine ESIs, using flash or positive blood aspirate to predict intravascular injections was 97.9% specific but only 44.7% sensitive. This suggests that negative aspiration of blood does not ensure a lack of vascular uptake. Similarly, in the cervical spine, vascular uptake injections occurred at a rate of nearly 20% with the use of fluoroscopy (confirmed by contrast injection), via a transforaminal approach. Again, a visible flash of blood in the needle hub or positive aspiration of blood demonstrated similar specificity and sensitivity to the lumbar injection study. Backache, postural puncture headache (0.5-1% for lumbar interlaminar injections and 0.6% for caudal epidural injections), nausea, vomiting, dizziness, and vasovagal reaction have been reported. Bleeding along the trajectory of the injection, including in proximity to the nerve roots and/or the spinal cord (epidural hematoma), is a rare but potentially serious complication. Epidural hematoma occurs in 0.01-0.02% of procedures. Infection is a rare complication but may be relatively more common in immunocompromised patients and can include epidural abscess and meningitis. Nerve root injury has been reported. Mild hypothalamic-pituitary-adrenal axis suppression has been reported from 1-3 months after receiving a total of 3 epidural injections (once weekly) with 80 mg of Aristocort in 7 mL of 1% lidocaine. Cervical ESIs carry similar risks, with the apparent caveat that any damage to the spinal cord at the level of the cervical spine often results in greater impairment than damage at the lumbar levels and may precipitate respiratory arrest at higher cervical levels. There is the risk of spinal cord trauma if the operator performs direct injection into the spinal cord via an interlaminar approach, a risk that is essentially absent at the lower lumbar spine, since the spinal cord terminates at the level of L2. Cord trauma can also result from compression of the spinal cord from an epidural abscess or an epidural hematoma. Despite these risks, most agree that complications are minimal when ESIs are performed by a physician with the proper equipment, training, and technique. The complications of ESIs can probably be averted by using fluoroscopic guidance, contrast enhancement to avoid vascular uptake, DSA, nonparticulate corticosteroid, and a test dose of local anesthetic before injection of corticosteroid. In the lumbar spine, transforaminal ESI using the Kambin triangle is recommended to avoid needle injury to the radiculomedullary artery or nerve root. Therefore, aside from the use of live-time fluoroscopy with contrast injection during the cervical transforaminal ESIs to visualize and avoid intravascular injections, the use of smaller-particulate corticosteroid preparations was also recommended to further reduce the risk of central nervous system infarct. Digital subtraction angiography (DSA) has demonstrated the ability to be able to pick up more venous flow and nonvisible arterial flow during cervical transforaminal ESIs. Therefore, applying DSA during the cervical transforaminal ESIs is recommended to increase safety. Using smaller-particulate corticosteroid such as dexamethasone may reduce the probability of vascular embolism in case of inadvertent intraarterial needle placement during ESIs. A randomized study comparing the effectiveness of dexamethasone and triamcinolone used in cervical transforaminal epidural injection found that at 4 weeks postinjection, both groups exhibited statistically and clinically significant improvement. Although the dexamethasone was slight less effective than triamcinolone, the difference was neither statistically nor clinically significant. To date, the authors are unaware of any published literature pertaining to central nervous infarcts secondary to the dexamethasone used in the ESIs. It is advocated injecting a test dose of local anesthetic (nonparticulate medication) after the needle is placed and the correct position is verified with contrast and then waiting for up to 2 minutes to ensure that the patient does not experience adverse central nervous system effects. These adverse effects, including seizures, transient paresis, and respiratory depression, are generally thought to be reversible and an additional indicator of possible vascular uptake. Additionally, avoidance of heavy sedation during procedures has been recommended to decrease adverse effects. In fact, Glaser and Shah have indicated that the “safe triangle” target of the conventional lumbar transforaminal approach is an “unsafe triangle”. There were more than 10 published cases of lumbar paraplegia after the transforaminal ESIs through traditional or conventional approaches. It is important to note that in each of these cases, use of particulate corticosteroid was involved. Aside from advocating using nonparticulate corticosteroids, to prevent these “black swan” events, using a different approach, Kambin triangle for lumbar transforaminal ESIs, is gaining more and more attention. In fact, surgical studies with endoscopic discectomy through the Kambin triangle also reported fewer nerve and vascular injury events. To these authors’ knowledge, there have been no case reports on the paraplegia after lumbar transforaminal ESIs using the Kambin triangle. A retrospective study on lumbar transforaminal ESIs with the Kambin triangle using live fluoroscope and DSA techniques on 200 patients revealed no arterial uptake of contrast during injections (accepted and to be presented in the 21st annual scientific meeting of International Spine Intervention Society). Thus, we agree with other interventionists. Lumbar transforaminal ESIs should be performed with the Kambin-triangle approach. The optimal timing of epidural injection is unknown. Patients with radicular symptoms often undergo a few weeks of treatment, including relative rest or activity modification, medication, physical therapy, and/or manual therapy, prior to undergoing epidural injections. 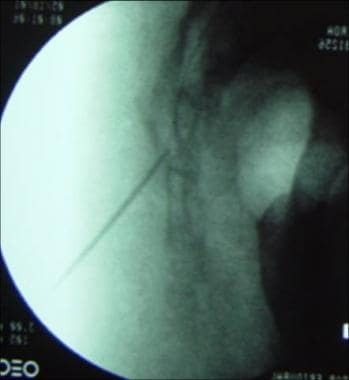 If the patient does not have success with such a program or if the therapy cannot progress because the patient's pain is too severe (as long as there are no signs of progressive neurologic deficits), epidural injection is indicated for pain control. In contrast, early use of epidural steroid injections (ESIs) can be considered in patients with severe radicular pain that does not respond even to opioid medication or in whom the pain is severely interfering with sleep habits and daily functioning. Early ESIs also carry the theoretical benefit of controlling inflammation at the early stage and of preventing permanent neural damage, such as nerve fibrosis from the prolonged inflammatory process. Under these circumstances, early administration of ESIs may have a more beneficial effect than would later/delayed use. The interval between injections varies with the steroid preparation used. Because injected methylprednisolone has been reported to remain in situ for approximately 2 weeks, the clinician should consider waiting approximately 2 weeks after the injection to assess the patient's response and to determine if it would likely be beneficial to administer a repeat injection. However, this 2-week interval may be reduced if a different (short-acting) steroid is used or if the clinical scenario warrants an earlier performance of the repeat epidural. In general, however, routine performance of a predetermined fixed number of epidural injections without a clinical reevaluation in between injection procedures should be discouraged. The ideal number of epidural injections to be administered for a given clinical scenario is often unclear, because data in the current literature are not clear on the exact number of ESIs to be administered and the timing that should be used. Clinical practice patterns, however, suggest that up to 3-4 injections may be used for acute radicular pain syndromes. Reevaluation by a physician after each injection seems to be indicated to determine the need for additional procedures prior to pursuing a series of 3 epidural injections, regardless of clinical response, since there are no medical outcome studies to clearly support such a regimen. Studies have suggested that depending on the particular clinical scenario, the total dose of methylprednisolone should probably not exceed approximately 3 mg/kg of body weight, in order to prevent excessive salt and water retention. A study of methylprednisolone dosage in patients with chronic lower back pain found that a 40-mg dose is just as effective as an 80-mg dose in improving disability. The lower dose should be considered for patients who receive repeat injections. For interlaminar ESIs, the typical corticosteroid doses are 12-18 mg for betamethasone and 80-120 mg for methylprednisolone. Half of these steroid doses are generally used when performing transforaminal ESIs. The epidural steroid is injected in a diluent, such as lidocaine (1-2%) and/or normal saline. The volume of the injectate is dictated mainly by the approach used. In cervical and thoracic epidural injections, a total of 3-5 mL may be used for ESIs using the interlaminar approach. However, in cervical and thoracic transforaminal ESIs, clinicians generally use a total volume of only about 1.5-2 mL. The volume used for lumbar ESIs is slightly greater, generally being 6-10 mL for interlaminar ESIs, up to 20 mL for caudal ESIs, and 3-4 mL for transforaminal ESIs. A variety of approaches can be used to inject corticosteroids into the epidural space. For purposes of this article, the authors generally refer to all epidural steroid injections as ESIs, only specifying the specific type of approach if needed for a point of distinction or clarification. Cervical and thoracic epidural injections can be carried out using interlaminar and transforaminal approaches. Lumbar epidural injections can be performed using 3 approaches: transforaminal, interlaminar, and caudal. Interlaminar approach at the L5-S1 level on the left, anteroposterior view. Upon contact with the ligamentum flavum, a “loss of resistance” technique is implemented with saline until proper advancement results in penetration into the epidural space. Botwin and colleagues used 5 mL of contrast media via a lumbar interlaminar approach to assess for flow. In 36% of the injections, the contrast was noted to spread into the ventral space. Unilateral flow was observed in 84% of the injections. The amounts of cephalad and caudad flow averaged 1.28 and 0.88 levels, respectively. Transforaminal approach at the S1 level on the right, anteroposterior view. The medication composite for an epidural injection consists of a steroid preparation and, in most cases, an anesthetic. A contrast medium also is generally used, along with fluoroscopic-guided procedures, to verify placement and distribution of the injectate. Newer formulations, labeled as nonionic radiocontrast agents, are commonly used at present for spinal injection procedures. Although these agents do contain iodine atoms, there is minimal free iodine present, allowing for a formulation with a more physiologic osmolality, as well as less free iodine. These media undergo primarily renal excretion with little, if any, metabolism and deiodination. For patients with a suspected allergy to contrast medium, consideration should be given to pretreatment orally with antihistamines and corticosteroids prior to the procedure. Acute allergic reactions generally occur in the first few minutes after injection. Ideally, therefore, patients should be observed for at least a few minutes after the procedure. Local anesthetics bind with intracellular sodium channels to prevent sodium influx, which occurs during depolarization of the neural membrane. The nerve impulse fails to propagate if sufficient sodium channels are blocked. When local anesthetics are used to minimize pain during an epidural procedure, the medication is acting on closed sodium channels. In this case, the duration of the local anesthetic is shorter than it is when pain is present and the sodium channels are open. A local anesthetic's time to onset of action can be decreased by (1) buffering the anesthetic by adding a base (eg, bicarbonate) and (2) increasing its concentration. Typically, 1% lidocaine is used as a skin anesthesia for epidural steroid injections (ESIs). Anesthetics are classified as amides or esters. Esters, such as procaine, are metabolized by plasma cholinesterase and are then excreted by the kidney. Amides, such as lidocaine and bupivacaine, are metabolized by the liver and then in the kidney. Because amides are metabolized more slowly than esters, they have a longer duration of action. Different steroid preparations are used for ESIs. Examples include dexamethasone (Decadron), triamcinolone (Kenalog), betamethasone (Celestone), and methylprednisolone (Solu-Medrol). Dexamethasone - Particles were 5-10 times smaller than red blood cells, contained few particles, and showed no aggregation. Triamcinolone - Particles varied greatly in size, were densely packed, and formed extensive aggregations. Betamethasone - Particles varied greatly in size, were densely packed, and formed extensive aggregations. Methylprednisolone - Particles were relatively uniform in size, smaller than red blood cells, and densely packed and did not form very many aggregations. Most patients take several days to respond to ESIs. Celestone Soluspan provides an extended anti-inflammatory effect, whereas Depo-Medrol and Kenalog provide a more rapid anti-inflammatory effect that is of shorter total duration. Multidose vials of Depo-Medrol contain benzyl alcohol, which is potentially toxic when administered locally to neural tissue and may increase the risk of arachnoiditis or meningitis. Thus, for epidural injections, many physicians prefer to use steroid preparations without such preservatives. One option is to use only single-dose vials of the corticosteroids, because these generally do not contain benzyl alcohol. However, for some steroid products, even the single-dose vials may contain at least some preservatives or antimicrobial additives, so physicians should be aware of all of these factors when deciding on the steroid to be used for the injection. The judicial use of epidural steroid injections (ESIs) in conjunction with a properly designed rehabilitation program may play a very important role in the conservative management of patients with severe radicular pain, improving their quality of life and function. What are epidural steroid injections (ESIs)? What are the mechanisms of radicular low back pain relative to epidural steroid injections (ESIs)? What are the mechanisms of action for epidural steroid injections (ESIs) for back pain? What are the indications for epidural steroid injections (ESIs)? What are the contraindications for epidural steroid injections (ESIs)? What is the efficacy of epidural steroid injections (ESIs) for LBP? Which factors affect the efficacy of epidural steroid injections (ESIs)? What is the efficacy of lumbar transforaminal epidural steroid injections (ESIs)? What is the efficacy of lumbar caudal epidural steroid injections (ESIs)? What is the efficacy of lumbar interlaminar epidural steroid injections (ESIs)? What is difference between interlaminar and transforaminal lumbar epidural steroid injections (ESIs)? What is the rate of spinal surgery following epidural steroid injections (ESIs)? What are effects of epidural steroid injections (ESIs) on diskectomy outcomes? What is the efficacy of cervical epidural steroid injections (ESIs)? What is the role of fluoroscopy and contrast in the administration of epidural steroid injections (ESIs)? What are the possible complications of lumbar epidural steroid injections (ESIs)? What are the possible complications of cervical epidural steroid injections (ESIs)? How can the risk of complications from epidural steroid injections (ESIs) be minimized? How safe are cervical transforaminal epidural steroid injections (ESIs)? How safe are lumbar transforaminal epidural steroid injections (ESIs)? What is the optimal timing of epidural steroid injections (ESIs)? What is the frequency of epidural steroid injections (ESIs)? What is the dosage used for epidural steroid injections (ESIs)? What are the approaches used for epidural steroid injections (ESIs)? How is an interlaminar epidural steroid injection (ESI) administered? How are transforaminal epidural steroid injections (ESIs) administered? How are caudal epidural steroid injections (ESIs) administered? Which medications are used in epidural steroid injections (ESIs)? What are clinical findings of corticosteroids used in epidural steroid injections (ESIs)? What is the role of epidural steroid injections (ESIs) in the management of radicular pain? Sicard A. Les injections médicamenteuses extra-durales par voie sacro-coccygienne. CR Soc Biol Paris. 1901. 53:369. Vad VB, Bhat AL, Lutz GE, et al. Transforaminal epidural steroid injections in lumbosacral radiculopathy: a prospective randomized study. Spine. 2002 Jan 1. 27(1):11-6. [Medline]. Botwin KP, Gruber RD, Bouchlas CG, et al. Fluoroscopically guided lumbar transformational epidural steroid injections in degenerative lumbar stenosis: an outcome study. Am J Phys Med Rehabil. 2002 Dec. 81(12):898-905. [Medline]. Buenaventura RM, Datta S, Abdi S, Smith HS. Systematic review of therapeutic lumbar transforaminal epidural steroid injections. Pain Physician. 2009 Jan-Feb. 12(1):233-51. [Medline]. Barre L, Lutz GE, Southern D, et al. Fluoroscopically guided caudal epidural steroid injections for lumbar spinal stenosis: a retrospective evaluation of long term efficacy. Pain Physician. 2004 Apr. 7(2):187-93. [Medline]. [Full Text]. Conn A, Buenaventura RM, Datta S, Abdi S, Diwan S. Systematic review of caudal epidural injections in the management of chronic low back pain. Pain Physician. 2009 Jan-Feb. 12(1):109-35. [Medline]. Benyamin RM, Manchikanti L, Parr AT, et al. The effectiveness of lumbar interlaminar epidural injections in managing chronic low back and lower extremity pain. Pain Physician. 2012 Jul-Aug. 15(4):E363-404. Candido KD, Raghavendra MS, Chinthagada M, Badiee S, Trepashko DW. A prospective evaluation of iodinated contrast flow patterns with fluoroscopically guided lumbar epidural steroid injections: the lateral parasagittal interlaminar epidural approach versus the transforaminal epidural approach. Anesth Analg. 2008 Feb. 106(2):638-44. Ghai B, Vadaje KS, Wig J, Dhillon MS. Lateral parasagittal versus midline interlaminar lumbar epidural steroid injection for management of low back pain with lumbosacral radicular pain: a double-blind, randomized study. Anesth Analg. 2013 Jul. 117(1):219-27. [Medline]. Thefenne L, Dubecq C, Zing E, Rogez D, Soula M, Escobar E. A rare case of paraplegia complicating a lumbar epidural infiltration. Ann Phys Rehabil Med. 2010 Nov. 53(9):575-83. [Medline]. Rhee JM, Schaufele M, Abdu WA. Radiculopathy and the herniated lumbar disc. Controversies regarding pathophysiology and management. J Bone Joint Surg Am. 2006 Sep. 88(9):2070-80. [Medline]. Gharibo CG, Varlotta GP, Rhame EE, Liu EC, Bendo JA, Perloff MD. Interlaminar versus transforaminal epidural steroids for the treatment of subacute lumbar radicular pain: a randomized, blinded, prospective outcome study. Pain Physician. 2011 Nov-Dec. 14(6):499-511. [Medline]. Rados I, Sakic K, Fingler M, Kapural L. Efficacy of interlaminar vs transforaminal epidural steroid injection for the treatment of chronic unilateral radicular pain: prospective, randomized study. Pain Med. 2011 Sep. 12(9):1316-21. [Medline]. Radcliff K, Hilibrand A, Lurie JD, Tosteson TD, Delasotta L, Rihn J. The impact of epidural steroid injections on the outcomes of patients treated for lumbar disc herniation: a subgroup analysis of the SPORT trial. J Bone Joint Surg Am. 2012 Aug 1. 94(15):1353-8. [Medline]. Buttermann GR. Treatment of lumbar disc herniation: epidural steroid injection compared with discectomy. A prospective, randomized study. J Bone Joint Surg Am. 2004 Apr. 86-A(4):670-9. [Medline]. Rowlingson JC, Kirschenbaum LP. Epidural analgesic techniques in the management of cervical pain. Anesth Analg. 1986 Sep. 65(9):938-42. [Medline]. Benyamin RM, Singh V, Parr AT, et al. Systematic review of the effectiveness of cervical epidurals in the management of chronic neck pain. Pain Physician. 2009 Jan-Feb. 12(1):137-57. [Medline]. Furman MB, O'Brien EM, Zgleszewski TM. Incidence of intravascular penetration in transforaminal lumbosacral epidural steroid injections. Spine. 2000 Oct 15. 25(20):2628-32. [Medline]. Smuck M, Fuller BJ, Yoder B, et al. Incidence of simultaneous epidural and vascular injection during lumbosacral transforaminal epidural injections. Spine J. 2007 Jan-Feb. 7(1):79-82. [Medline]. Huntoon MA. Anatomy of the cervical intervertebral foramina: vulnerable arteries and ischemic neurologic injuries after transforaminal epidural injections. Pain. 2005 Sep. 117(1-2):104-11. [Medline]. Chang Chien GC, Candido KD, Knezevic NN. Digital subtraction angiography does not reliably prevent paraplegia associated with lumbar transforaminal epidural steroid injection. Pain Physician. 2012 Nov-Dec. 15(6):515-23. [Medline]. Dreyfuss P, Baker R, Bogduk N. Comparative effectiveness of cervical transforaminal injections with particulate and nonparticulate corticosteroid preparations for cervical radicular pain. Pain Med. 2006 May-Jun. 7(3):237-42. [Medline]. Chang Chien GC, Candido KD, Knezevic NN. Digital subtraction angiography does not reliably prevent paraplegia associated with lumbar transforaminal epidural steroid injection. Pain Physician. 2012 Nov-Dec. 15(6):515-23. Glaser SE, Shah RV. Root cause analysis of paraplegia following transforaminal epidural steroid injections: the 'unsafe' triangle. Pain Physician. 2010 May-Jun. 13(3):237-44. Park KD, Lee J, Lee H, Park Y. Kambin’s triangle versus the supraneural approach for the treatment of lumbar radicular pain. Am J Phys Med Rehabil. 2012. 91:1039-1050. Zhu J, Falco FJ, Formoso F, Onyewu O, Irwin FL. Alternative approach for lumbar transforaminal epidural steroid injections. Pain Physician. 2011 Jul-Aug. 14(4):331-41. [Medline]. McCahon RA, Ravenscroft A, Hodgkinson V, Evley R, Hardman J. A pilot study of the dose-response of caudal methylprednisolone with levobupivacaine in chronic lower back pain. Anaesthesia. 2011 Jul. 66(7):595-603. [Medline]. 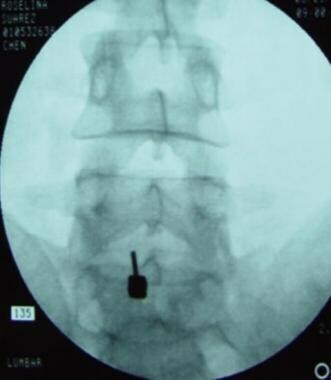 Botwin KP, Natalicchio J, Hanna A. Fluoroscopic guided lumbar interlaminar epidural injections: a prospective evaluation of epidurography contrast patterns and anatomical review of the epidural space. Pain Physician. 2004 Jan. 7(1):77-80. [Medline]. [Full Text]. Kim D, Brown J. Efficacy and safety of lumbar epidural dexamethasone versus methylprednisolone in the treatment of lumbar radiculopathy: a comparison of soluble versus particulate steroids. Clin J Pain. 2011 Jul-Aug. 27(6):518-22. [Medline]. Manchikanti L, Singh V, Cash KA, Pampati V, Damron KS, Boswell MV. A randomized, controlled, double-blind trial of fluoroscopic caudal epidural injections in the treatment of lumbar disc herniation and radiculitis. Spine (Phila Pa 1976). 2011 Nov 1. 36(23):1897-905. [Medline]. Manchikanti L, Knezevic NN, Boswell MV, Kaye AD, Hirsch JA. Epidural Injections for Lumbar Radiculopathy and Spinal Stenosis: A Comparative Systematic Review and Meta-Analysis. Pain Physician. 2016 Mar. 19 (3):E365-410. [Medline]. Abdi S, Datta S, Trescot AM, et al. Epidural steroids in the management of chronic spinal pain: a systematic review. Pain Physician. 2007 Jan. 10(1):185-212. [Medline]. Baker R, Garg V, Bogduk N. Local anesthetic primer for the interventional pain specialist. ISIS Sci Newsletter. 2006. 5(5):13-20. Becker C, Heidersdorf S, Drewlo S, et al. Efficacy of epidural perineural injections with autologous conditioned serum for lumbar radicular compression: an investigator-initiated, prospective, double-blind, reference-controlled study. Spine. 2007 Aug 1. 32(17):1803-8. [Medline]. Berg A. Clinical and myelographic studies of conservatively treated cases of lumbar intervertebral disk protrusion. Acta Chir Scand. 1952 Dec 10. 104(2-3):124-9. [Medline]. Bhargava A, DePalma MJ, Ludwig S, et al. Injection therapy for lumbar radiculopathy. Curr Opin Orthop. June 2005. 16(3):152-7. Coomes EN. A comparison between epidural anaesthesia and bed rest in sciatica. Br Med J. 1961 Jan 7. 5218:20-4. [Medline]. [Full Text]. DePalma MJ, Bhargava A, Slipman CW. A critical appraisal of the evidence for selective nerve root injection in the treatment of lumbosacral radiculopathy. Arch Phys Med Rehabil. 2005 Jul. 86(7):1477-83. [Medline]. Depalma MJ, Bhargava A, Slipman CW. A critical appraisal of the evidence for selective nerve root injection in the treatment of lumbosacral radiculopathy. Arch Phys Med Rehabil. 2005 Jul. 86(7):1477-83. Derby R, Date ES, Lee C, et al. Size and aggregation of corticosteroids used for epidural injections. ISIS Sci Newsletter. 2006. 5(4):30-7. Dominguez E. The practice of cervical transforaminal injection of steroids deserves more scrutiny. Pain Physician. 2005 Jul. 8(3):323-4. [Medline]. [Full Text]. Evans W. Intrasacral epidural injection in the treatment of sciatica. Lancet. 1930. 2:1225-9. Gajraj NM. Avoid excessive sedation during cervical injections. Anesthesiology. 2005 Apr. 102(4):869; author reply 870. [Medline]. Goebert HW Jr, Jallo SJ, Gardner WJ, et al. Sciatica: treatment with epidural injections of procaine and hydrocortisone. Cleve Clin Q. 1960 Oct. 27:191-7. [Medline]. Korhonen T, Karppinen J, Paimela L, et al. The treatment of disc herniation-induced sciatica with infliximab: results of a randomized, controlled, 3-month follow-up study. Spine. 2005 Dec 15. 30(24):2724-8. [Medline]. Korhonen T, Karppinen J, Paimela L, et al. The treatment of disc-herniation-induced sciatica with infliximab: one-year follow-up results of FIRST II, a randomized controlled trial. Spine. 2006 Nov 15. 31(24):2759-66. [Medline]. Lievre JA, Bloch-Michel H, Pean G, et al. L'Hydrocortisone en injection locale. Rheumatism. 1953. 20:310-11. Lindahl O, Rexed B. Histologic changes in spinal nerve roots of operated cases of sciatica. Acta Orthop Scand. 1951. 20(3):215-25. [Medline]. McLain RF, Kapural L, Mekhail NA. Epidural steroid therapy for back and leg pain: mechanism of action and efficacy. Spine J. 2005. 5:191-201. Nash TP. Epiduroscopy for lumbar spinal stenosis. Br J Anaesth. 2005 Feb. 94(2):250; author reply 250-1. [Medline]. [Full Text]. Viner N. Intractable sciatica the sacral epidural injection-an effective method of giving relief. Clin Med Assoc Med J. 1925. 15:630-4. Yuan PS, Booth RE, Albert TJ. Nonsurgical and surgical management of lumbar spinal stenosis. Instr Course Lect. 2005. 54:303-12. [Medline].